There was big love for the tiny house at Sunset’s annual Celebration Weekend. We were lucky to have four experts speak about their experiences building and living in a tiny house, and being part of the tiny house community. For Catherine Zola Allen, building a tiny home was a way for her to afford to stay in California and live on an acreage. She said: I wanted a garden and a lot of land. This was about the only way I could have my own space in California. And I still lay in bed and can’t believe I’m surrounded by a structure I made myself. Tiny home architect Vina Lustado built a tiny house to embrace a more ecologically responsible way of living. Her home is less than 200 square feet, but she says the movement is an inclusive one: Tiny is a state of mind more than it is about the size of your space. It’s about being mindful of exactly how many things and resources you really need. 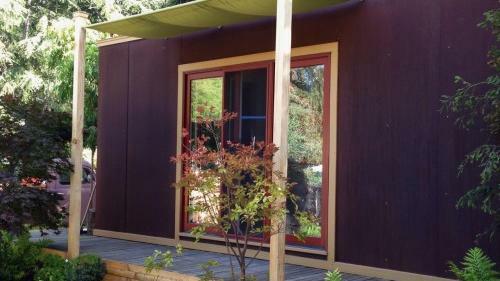 Tiny House Blog publisher Kent Griswold agreed: I don’t live in a “tiny home,” but I do live in a small home and live the tiny lifestyle of staying within my financial and environmental means. Sunset readers who attended the presentation got a sneak peek at a new documentary on tiny homes–a film that is available on iTunes today. You can watch the trailer for TINY: The Movie below. Then let us know what type of tiny appeals to you the most! TINY: A Story About Living Small – Trailer from TINY on Vimeo.